Being a Jew (even a bad one) in December in the U.S. can prove trying. I don’t mind the trees, wreaths and boughs (they smell great! ), the perpetual Christmas music playing everywhere (well, so long as it’s Bing or Ella), or the plethora of baking magazines stocking the racks at every grocery store in town (bring them on!). What bothers me is the assumption that everybody celebrates Christmas. During Chanukah this year, the nice Peruvian delivery man from one of our vendors at work wished me a Feliz Navidad. I smiled and wished him a Happy Chanukah back. Despite being Jew Crew, I’m down with Christmas just like I’m down with Jesus: he seems like he was a cool guy, and if Christmas tricks people into baking a lot and celebrating trees, then I can get behind it. That lots of yummy foods (and drinkles) are associated with the birth of Jesus doesn’t make me want to eat (or drink) them any less. Any Scroogy tendencies I may have are in no way aimed at the culinary side of Christmas. Cookies, spice cakes, peppermint bark – the more the merrier. Ho, ho hos. I’m unclear as to whether my recent hankering for gingerbread has anything to do with the impending holiday, or if it’s just the cold making me want to eat everything in sight, bear-like, in preparation for a long winter. 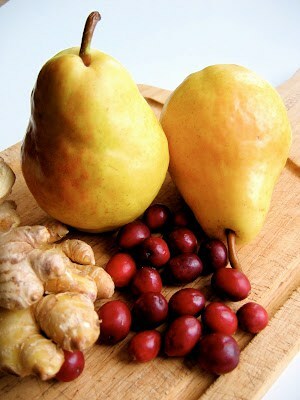 Either way, warming spices and pears seem to fit the bill perfectly this time of year. Inspired by a recipe in Mani Niall’s book Sweet!, I decided to add cranberries to the mix, as I didn’t get enough of them yet this year, and bake this cranberry pear upside-down gingerbread. 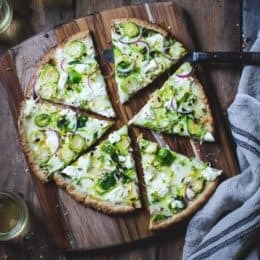 After a bit of analysis paralysis spent researching dozens of recipes, I finally threw caution to the wind and made one up. I melted butter, brown sugar and salt together in a 9″ round pan, arranged the cranberries and pears over the top, then whisked up a batter of more melted butter, blackstrap molasses, white sugar, fresh and dried ginger, cinnamon, black pepper (as well as the usual cakey ingredients), and baked it up. I liked the balance of flavors – spicy, sweet, bitter, tart – but the gingerbread part hardly rose at all and had a dense, dry mouthfeel. I swapped out sunflower oil for the butter and upped the leavening for the second trial. Crossing my fingers, I turned the finished cake out onto a platter. 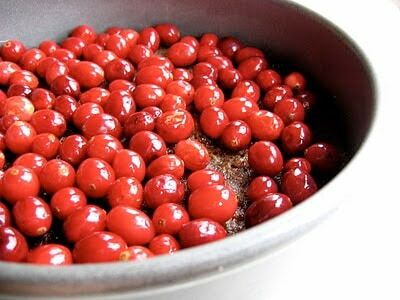 The glowing red cranberries glistened prettily as the toffee-flavored sauce oozed down the sides. I cut a wedge of cake and the pear slices revealed themselves, tucked between the cake and the berries. 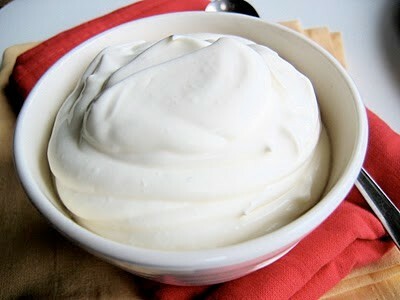 A dollop of whipped cream tempered the heat of the ginger and mellowed the deep molasses flavor. Fresh from the oven, the cake is springy and tender; as it sits, it absorbs the juices from the baked fruit, becoming more moist and gooey, similar in texture to a steamed pudding. 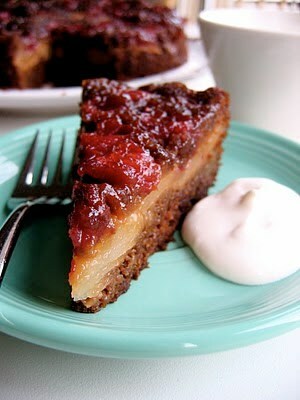 The tang of the berries plays off the mild pears and the deep, dark, spicy cake. 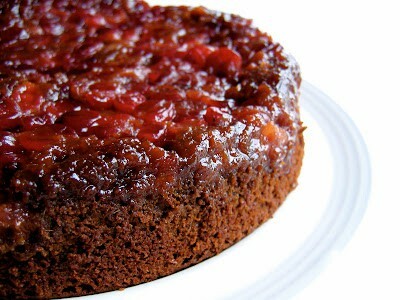 The high ratio of fruit to cake should assuage any guilt you may feel regarding indulgence. Hey, it’s the holidays! Whatever your celebratory persuasion – Christmas, Chanukah or Ursidae – this cake makes a satisfying dessert after any meal, be it a roast ham, a bowl of Chinese take-out, or an unsuspecting salmon. 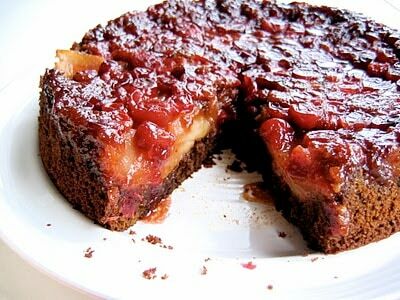 Be sure to use ripe pears for this cake. They should smell fragrant and have a hint of give when pressed. Grease the sides of a 9″ round cake pan with a bit of the butter, then place the rest of the butter pieces in the bottom of the pan. Sprinkle the brown sugar and the salt evenly over the butter, and place in the oven until melted and bubbly, about 10 minutes. 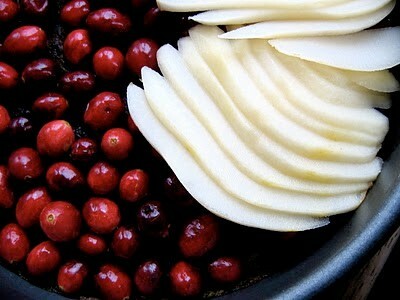 Dump in the cranberries (they should almost completely cover the bottom), then carefully the pears over the cranberries. Set aside while you make the batter. 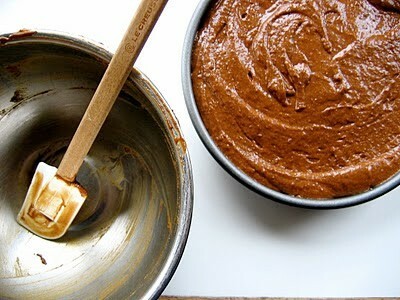 In a large bowl, whisk together the oil, grated ginger, sugar, molasses and egg to combine. Whisk in the milk. In a medium bowl, sift together the flour, baking soda, baking powder, salt, powdered ginger, cinnamon and pepper. Whisk the dries into the wets until smooth. The batter will be runny. Pour the batter over the pears. Bake the cake until it begins to pull away from the sides of the pan and a toothpick inserted into the center comes out clean, 30 – 35 minutes, rotating halfway through. Run a thin knife or small, offset spatula around the perimeter of the cake to loosen it. Invert a large plate over the cake. Wearing oven mitts, grasp both the plate and the cake pan and flip them over. Carefully lift the pan off. 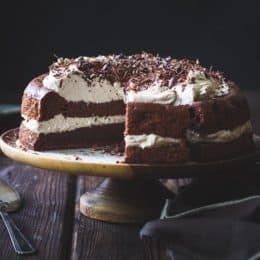 If some cake has stuck to the pan, you can scrape it off and spackle it back on (or just eat it – it IS the best part, and none will be the wiser). Serve the cake warm or at room temperature, with a dollop of whipped cream or crème fraîche. The cake is best the day it is made, but you can store it in an airtight container at room temp or in the fridge for a day or two. Um… ya bringing that over to Paxton's Pauper's Xmas Eve? My mouth is salivating. I, too, made up a spice cake batter for a pear upside-down skillet cake recently. Was delicious, and quite similar to yours. Alas, mine had no cranberries. Boo. 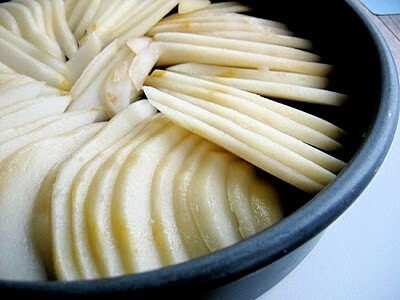 I *did* just get gifted some gorgeous pears that need to be used soon…maybe I'll make this tonight!! This was the absolute winner for holiday baking this year. We ended up with a smaller format (my having erroneously used a 9" pie plate instead of cake pan) and had to adjust proportions on the fly, but we still polished it off not long after it made it out of the oven. 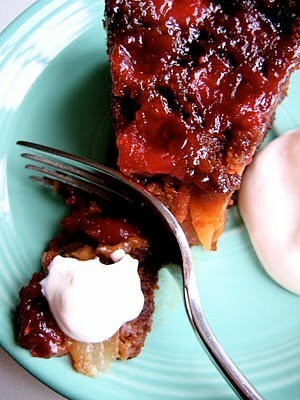 It had a wonderful balance between the sweet, spice, and the tartness of the cranberries. 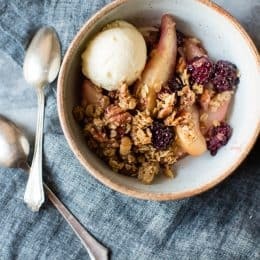 I wonder if a variation with fresh apples instead of the pears would work once they come back in the Fall? We shall have to see…. Stan – I'm so glad you liked it! 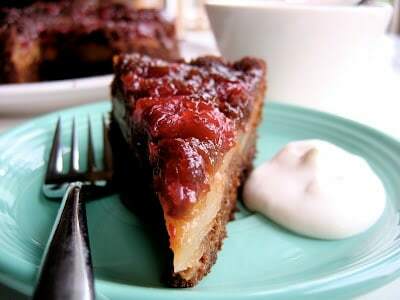 I bet apples would be great, though you might need to cook them first on their own (like here: https://www.bojongourmet.com/2010/10/uber-apple-upside-down-cake.html) since they don't soften as much as pears do during baking. I know I’m commenting yeeeaaaarrrrsssss after you posted this, but I just want to tell you first, that this was so delicious and everyone raved for days about the cake. Secondly, I just wanted to note that for me, I had to bake the cake for at least an hour, and up to an hour and ten minutes at times. Whenever I checked the cake at 30 minutes it was still pretty much liquid. Anyway, just incase I’m not the only one, wanted to point out that it may take double the time as stated in the recipe. You are amazing and congrats on the book!